The production style is also of historical interest in itself, as early usage of video chromakey with mechanically-synced cameras showcases some great re-creations of things impossible to film, and elaborate 2D images are stacked layer upon layer to create convincing and extremely artful 3D motion. Unlike today where we can brush off amazing effects with the thought that it was done by computer imagery, these effects make you sit back and wonder just how they managed to pull it all off in such quantities at this level of quality. If there is one great downside to this opening episode, it is perhaps that it doesn't quite present any kind of a plot for its pleasant and informative meanderings, no real driving over-arching questions to which its host Carl Sagan goes digging for answers. And this is a shame, because there is otherwise a well-structured story coming out of this episode, one whose answers lay the groundwork for the episodes to come. All it needs is some way for first time audiences to anticipate what is about to unfold, and to see each phase of this magnificent journey as the next logical step forward. Those of us who know the episode already I think are much better primed to just sit back, enjoy, and be fascinated all over again. After a very poetic opening that goes on a bit too long without any real information, the first episode here soon settles down to two basic halves. The first half is primarily a great zooming-in voyage from several galaxies away to the planet Earth, along the way marveling at many astronomical phenomena and landmarks from our perch in an imaginary spacecraft, with Carl Sagan at the helm. This spacecraft sequence looked so expensive for late 1970's production terms, I found myself wondering how long they could or would sustain it, and subsequently how they could ever top it with anything else. Indeed, it goes on for a solid 22 minutes until it rounds off the first half of the hour-long episode. But it is worth it in the end because with it, Sagan is bringing the audience up to speed with many of the terminology and concepts that will be used throughout the rest of the series. We learn about the concept of the light-year as a measure of interstellar distances, and experience the layout of the universe and our place within it on an ever shrinking scale. We see examples of places where stars are born (The Orion Nebula), where they are still fairly new (The Pleiades), and contrast different ages and lifespans of various types of stars. We also get an idea of the great dust clouds and various other types of matter making up various galaxies including our own. And before long, we are sailing past the familiar planets of our own solar system, getting an informative introduction to most of them. With this spacey opening half, Sagan is carefully taking us through WHAT we know. The return to Earth signifies a bit of a shift, as Sagan proceeds to recount the story of HOW we figured all that space stuff out in the first place. This second half features many filmed sequences on our Earth, and it begins in Egypt. Why not? We learn how a librarian in 300 B.C. managed to accurately calculate the circumference of the Earth, based in no small part on the idea that the Earth must be round instead of flat. A fairly simple, but pivotal launching point for serious astronomy. This naturally leads into the more unique of the first episode's two big set-piece scenes - a discussion of all the wonders of books, information, and experimental discoveries being systematically collected into the Great Library of Alexandria, reconstructed as a highly detailed model with Carl Sagan inserted into it via some impressive then-cutting-edge trick photography. It is impressive that we also have footage of the last remaining piece of the Library still standing today in Egypt, thus the coverage seems quite thorough. The topic is also quite tantalizing - that a good deal of the ideas we credit to recent Europeans were resurrected from the remains of this hybrid Greek/Egyptian civilization of so long ago, after spending a lot of time being forgotten. It also makes one wonder how often knowledge and technology is lost and rediscovered. This Great Library of Alexandria is the earliest known systematic gathering of the world's knowledge that we can easily verify today, but were there others before then, others that we have completely forgotten? Has evidence of other lost civilizations simply not yet surfaced to widespread public awareness? At this point, we accelerate through the story of ever growing, ever expanding astronomical knowledge, and we get some teasers for the things we will learn in future episodes, and see some of the places and historical figures that we will learn about in much more detail in episodes 3, 6, and 10. The goal here though is to get an overview of the big picture of astronomical discovery, to move past the question of what we know and how we know it, and finally move on to our best current idea of exactly WHEN we think we are in the big cosmic picture. Our final set-piece sequence is the introduction of the "Cosmic Calendar", which compresses the history of the universe so far into 1 "year". It's a fairly decent and useful way of contrasting the lengthy existence of the universe with the fairly recent introduction of Man's evolution to an intelligent and sentient form, able to contemplate his own existence in this grand scheme of things. I would say that this episode seems to have a higher percentage of "money shots" than many episodes that follow, and this premiere episode seems to be a bit more polished in production terms. As for content, Sagan is very much on top of his material here, and I feel he didn't really step into any trouble areas at all. The end result is that, even though he is still warming up for later topics here, this remains one of the best and most engaging episodes of the "Cosmos" series. 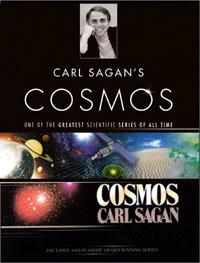 In 1980, the original Cosmos had a somewhat different musical background to what is now found in the 2000 Collectors' Edition on DVD and Blu-ray. Though Episode One features fewer differences than other episodes, we have decided to slowly roll out new music charts for Cosmos that list both soundtracks simultaneously, so that readers can see what changed and what stayed the same. Compositions that were unique to the original 1980 version are typically shaded blue-grey. Compositions that remained the same for both versions are stretched out across both sets of columns, although one rarely finds an exact sync between the two versions. In some cases such as Shostakovich's 11th Symphony, different recordings with different timings are used in each version. also known as "Theme from Cosmos"
This cue defines part A. - Wait, what's part A? "The Tsarina in a Barrel at Sea"
We're here for the very excellent track "Creation du Monde", which is part of the opening tour of the universe in the first episode of "Cosmos", and was used many times in other episodes as well, although I don't think you'll find the entire ten minute track appearing in its entirety in the show. 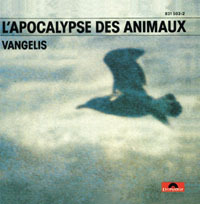 At any rate, this whole CD album is full of beautiful Vangelis pieces. 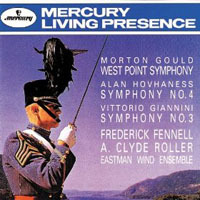 These recordings by the Eastman Wind Ensemble are the very ones used in "Cosmos". This album available on mp3 download. Read the data capsule review for the next episode: "One Voice in the Cosmic Fugue".